Our 2nd post of the Red Rim Butterfly. Sure it’s a bit far away, after it was on that bait log in the National Butterfly Center, in Mission, Texas. When it flew from the bait log, it flew into that small tree. The excitement we felt was spontaneous. This butterfly is cited in A Swift Guide to Butterflies of North America (Glassberg, 2017) as “R” for Rare! So, I moved robotically to the edge of the trail, and leaned over, just inches from the trench that dropped a few feet, and shot photograph after photograph. Biblis hyperia is an eye-full, just beautiful. No wear, not birdstruck. That red submarginal band on the hind wings! Oh, if only I had such a cape or something like it on the streets of Brooklyn. It would signal: Stay where you are, I’m toxic! I’m Thankful that I have been fortunate, fortunate enough to visit Israel nearly every year, since 2008. The HolyLand is where continents come together: Europe: Africa:Asia:The Middle East. That unique location dishes up butterflies common to many of those continents. 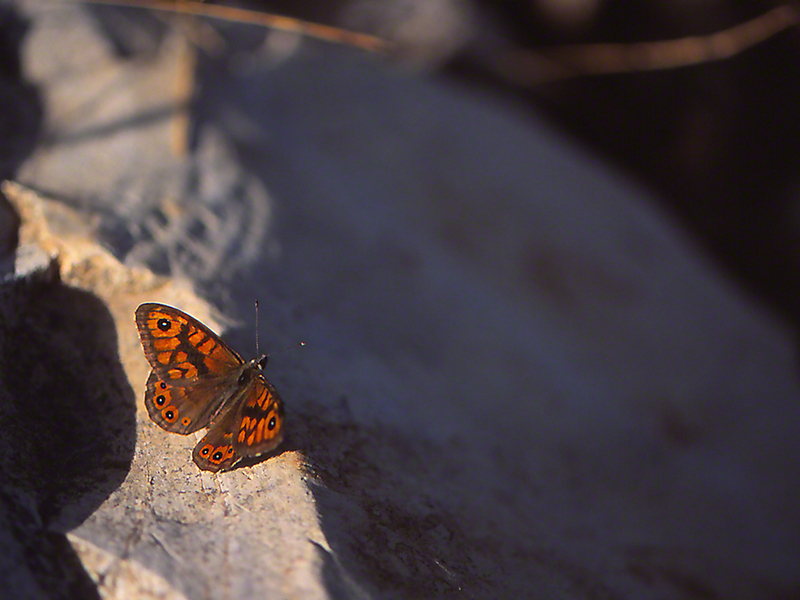 HolyLand butterflies are beautiful, swift, and many of wingedbeauty’s Followers really enjoy seeing them. Lasiomatta Megara seen here on Mt. Meron, a strategic peak in the northern Galilee, jolted me when I spotted it, doing what butterflies do early in the morning. Spring nights are cool on a mountain in the northern Galilee. When morning sun rises, butterflies find perches in that full morning sun, and remain still, while the sun’s rays warm them. Once warm, they can fly at full speed, and avoid the numerous predators that are about. The challenge was to make my approach in low profile, robotically, and also to not allow my shadow to cross Lasiomatta. This worked, and I got this ‘insurance shot,’ just before our subject did its disappearing act, and at considerable speed.